This is a spot that just a few Athenians know, whilst it is under their noses; just 8km from downtown Athens! This is the Botanical Garden of Diomidous, the largest botanical garden of the eastern Mediterranean. It was founded in 1952, and in 1975, after completion of landscaping, it was open to the general public. In its area of 470 acres, trees and bushes can be found from all over the world, as well as plants mentioned in Greek mythology and history, like the myrtle of Aphrodite and Socrates’ hemlock. The Botanical Garden constitutes a special area of scientific research and education, dedicated to knowledge about the environment and raising ecological awareness, and also one of the best places for a savory walk through its landscaped parts; from the flower field, the tree field and the greenhouse to its paved paths and artificial ponds. If properly prepared, you can have a picnic under the shade of the trees, in one of the outdoor monastery-type tables, where you can meet other groups or families (or even me?) rolling around on the grass. Nearby there are also the few lucky city residents that can drop by with the company of a book for a few moments of “natural reading”. 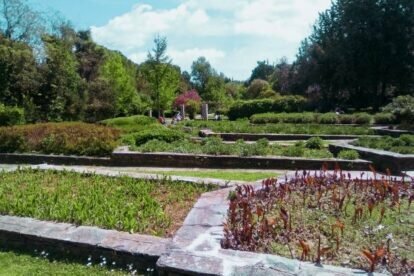 So, if you wish to visit this oasis of Athens, which is just 30 minutes from the city center, you can use the subway up to Agia Marina station and from there take one of the buses (811, 866, A16) heading towards the Botanical Garden.